widespread than we think, and could be happening in your own backyard. I’m not talking about blood-thirsty spiders, or anthropomorphic cockroaches. 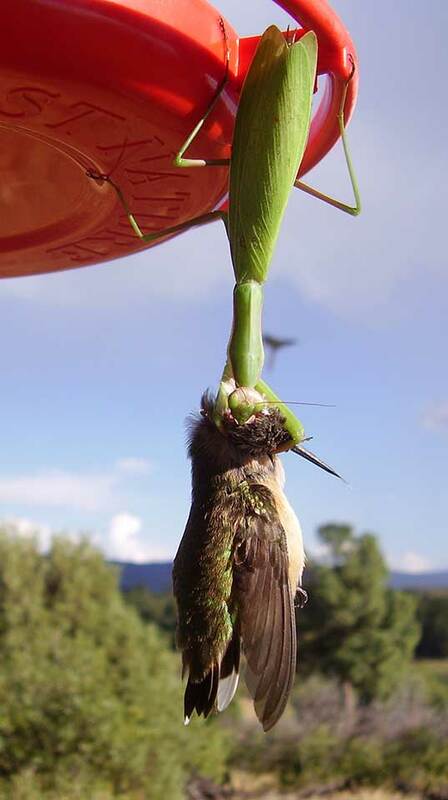 No, I’m referring to praying mantises and their penchant for catching and consuming birds. 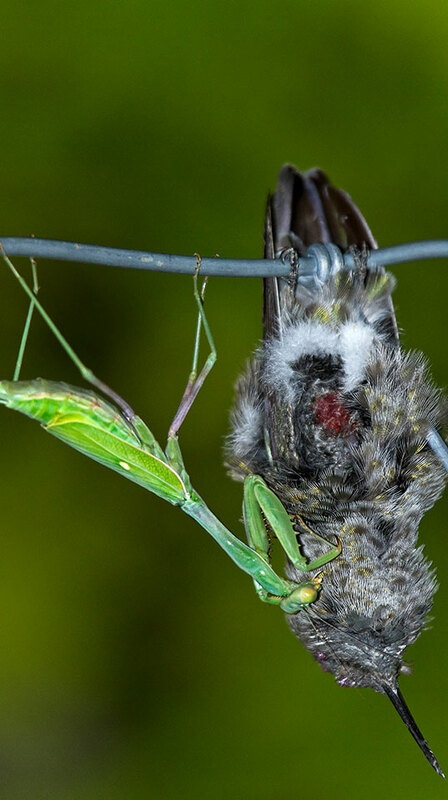 Bird-eating mantises are a feat of nature that’s rarely seen by humans. Yet, this phenomenon was curious enough for a group of zoologists from Switzerland and the United States to investigate. Knowing that praying mantises are carnivorous, not to mention voracious hunters, the researchers pored over 147 incidents—both amateur and scholarly—of mantis-on-bird predation, hoping to find clues about this behavior. The group’s findings, which were recently published in the Wilson Journal of Ornithology, suggest that mantises all over the world are chowing down on unsuspecting avians. Praying mantises were observed eating 24 different bird species across 14 families. Nearly 70 percent of accounts happened in North America, where tiny hummingbirds were the most common prey. States with the highest incidents of this, according to the study, were New York, North Carolina, Texas, Arizona, and California. “In the older literature, there are all sorts of anecdotes of mantises eating bizarre prey, such as centipedes and poisonous spiders, but these were usually ‘Gladiator’ encounters where investigators would throw together a mantis and another fearsome invertebrate in a jar or cage,” Michael Maxwell, the study’s co-author and a behavioral ecologist at National University, told me in an email. But sites like YouTube have made it easier for modern scientists to collect footage of mantises capturing birds in the wild. The idea to review reports of attacks stemmed from wanting “to sort out who is predator and who is prey,” Maxwell added. Interestingly, this behavior was observed on every continent except Antarctica, spanning twelve mantid species—something the study’s lead author Martin Nyffeler, a senior lecturer at the University of Basel, called “a spectacular discovery” in a statement. Weirdly, all of the mantises were identified as female. Females aren’t necessarily more aggressive, but they do engage in sexual cannibalism if very hungry. Twice, female mantids were observed feeding on a bird while also mating with a male. The implications of this weren’t addressed in the study, but the authors noted that predation often involved larger mantids, averaging six centimeters in body length. Coincidentally, some species of praying mantis are sexually dimorphic in size, meaning females outweigh their male counterparts.